And now, onto the show. Eagle Harbor Michigan. We start with Benny meeting an old acquaintance, the one who sent him to Purgatory but Benny’s looking for the man who gave the order. Both men threaten each other back and forth a bit before Benny lops the other vamp’s head off. Back to the boys. In Enid, Oregon. Dean walks in with Sam following soon after. Dean is pissed that Kevin has set them up again but calls him the “criminal prodigy rain man”. Sam is sort of on Kevin’s side about the time Dean nearly killed his mother. Dean goes outside and takes a call from Benny who admits he messed up. “What did you do?” and then “You took on how many?” But the thing Benny wanted to talk to Dean about was the fact he is not having easy mobility of his legs. Sam’s turn to be pissed; this time, that Dean is leaving him. Dean points out the dead end of the mission and asks for the Toblerone. Dean’s not done holding the year off over Sam and does so to gain a day off. Driving to Michigan, Dean flashes back to purgatory with a cross between happy and creepy whistling. Who am I kidding, whistling is always creepy. Sam resumes the hunt for Kevin on his laptop. That and stalking his girlfriend. Okay concerned. He hears an odd noise from the other room, goes to investigate, and finds a sprinkler system trying to work. Somehow this leads to a flashback for Sam where he’s talking to a kid at the hotel he’s staying at. Ah the broken air conditioner. Of course, that’s what this is all about. 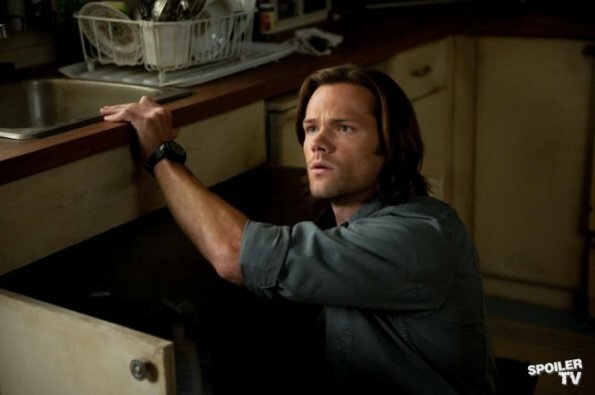 Sam is offered a job when he points out that he can fix the air conditioner and back in the present, he does the same only without pay. Sammy in the present. Sammy in the past. He fixed the air conditioner and the kid gives him a job fixing the sink of the vet who fixed his then/now dog. Back to Dean. 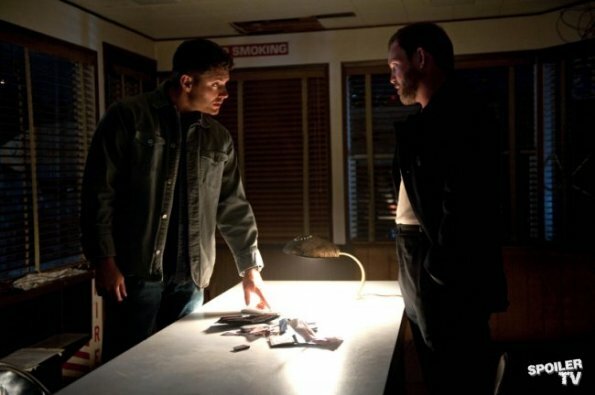 Benny is telling Dean about the dude who wants to kill him and the motis operandi that he used with his nest. He’d radio ahead the name and destination of the ship and the vamps already at seas would ambush it with him already about. They were vampire pirates. Vampirates. No, I didn’t come up with that one. My dad did and then two seconds later so did Dean. 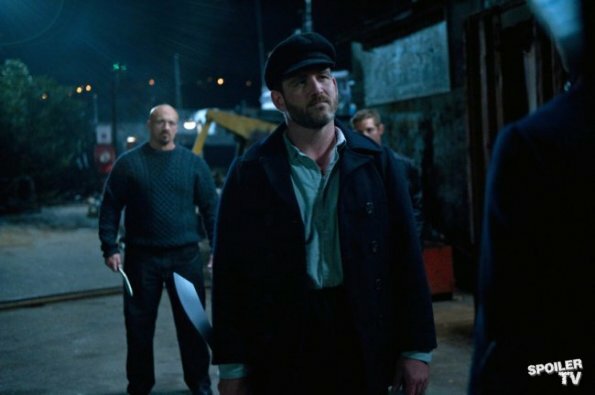 Benny’s crew seems up to the same tricks and Dean nearly texts Sam the details of what he’s doing. They walk aboard the ship and Benny senses something wrong. A look up to the staircase and the lovely un-dead Andrea stands there. She seems just as shocked to see him but allows him to be hit over the head by the Old Man. “Idiot....” Dean says from his hiding spot. Benny get handcuffed to a chair with a gnarly blade at his neck. “You’re going to make me do this all over again aren’t you?” Serento growls into his ear. Dean deflects a call from Sam. Sad music plays. Flashback occurs. Amelia asks why he’s in her house. He tells her it’s because of the mass of limes down the sink. As a bag of limes sits on her counter, I wonder whom the rinds belong to. He asks why if she’s been there three months she hasn’t settled it. “I have... why am I explaining myself to you. You’re just a handy drifter man.” Hmm. Dean returns Sam’s call. Sam is unhappy to hear that Dean went into a vamp nest alone. Dean says he went with a friend. “All your friends are dead.” “NOT what I called to talk about!” Benny is glib about the whole love of his afterlife sleeping with “god”. She’s unimpressed and smacks him across the jaw. Before sending the others out, kissing him, and being sweet as sugar to Benny. So which is the fake persona? Andrea offers him the chance to kill the Old Man as he’s proof the maker isn’t god. Benny points out he came to “burn the operation to the ground; to stop the killing.” “Do what you have to do.” Serento comes back in and says the Old Man wants Benny now. Dean is still/more unhappy with his situation damn near demanding Sammy come out to help him after texting the coordinates. Benny’s maker asks how he found his way back from hell. “Not hell; next door.” “Where’s that?” “oh, I’ll just have to show you.” The not-so-Old Man tells Benny he wailed like the world’s ugliest baby when he saw all the pieces Benny had been ripped to. That’s why he turned the girl so he’s have someone to remember him by. Flashback Benny is a little less optimistic about Cas’s presence than Dean is thinking that Cas will get them both killed. Flashback Sam is still only calling his rescue pet Dog. Angry Lady isn’t thrilled but isn’t upset over it. Amelia thinks Sam is pretty creepy from his Army surplus wardrobe (which I happen to like...) to his having seen a lot of stitches (a lot more than her, I’d bet.) Sam gets her to loosen up a little by asking if she has anyone. Apparently she doesn’t any longer. In the present, Dean isn’t answering his phone again. When will Sam learn? Benny nearly kills the Old Man. The Old Man is dead, long live the Old Man. Oh wait....Benny wants to leave but Andrea doesn’t. She still thinks the operation is perfect but I have a feeling Benny won’t agree. Dean chops Andrea’s head off. What is it with that guy and killing other people’s girlfriends? Benny though, seems to be more on board than Sam was only forlornly asking why Dean resurrected him. He could have drain his soul anywhere and no one would have known. Dean asks if he’s okay and Benny says he is. 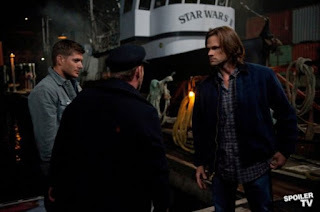 Back in the past where Dean, Benny, and Cas are dodging Levis it might be another story. How is Cas growing a beard and Dean isn’t? Admittedly I’d rather see Jensen Ackles clean shaven but still, lack of logic. Sam arrives and shakes hands with the vampire. “I’ve heard a lot about you, Sam.” And then Benny leaves the brothers to talk. Next time on Supernatural: Sam knows about Benny and "You ditched me for a girl!"